The more I do this work, the more I am convinced that you can develop MVP experiments for almost any product. 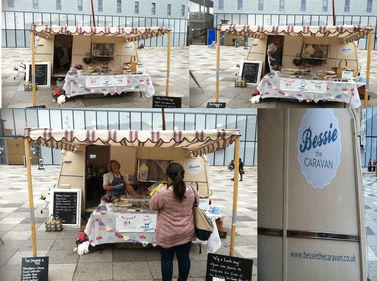 I was walking around a university campus the other day and saw a woman running a cake shop out of a caravan! I just had to take pictures! She was speaking with customers, probably learning what sells and doesn’t sell; and she was doing it cheaply. When most people think of starting cake shops they immediately start scouting locations and finding out how much it costs to build a kitchen. This can be a road to failure if you don’t first learn how to create a product customers want. Long Live Bessie the Caravan! More power to your minimum viable cake shops!